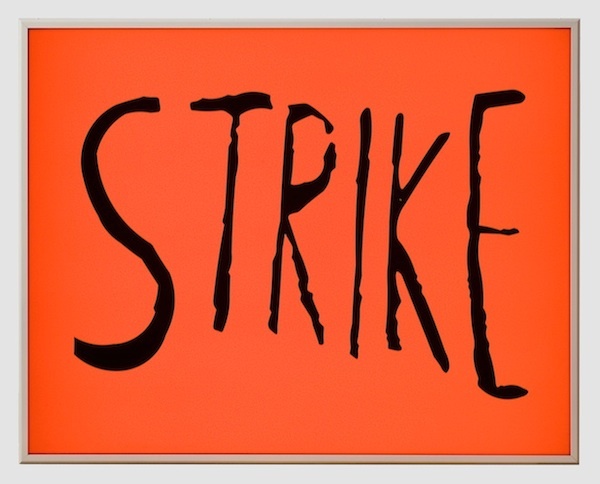 Sam Durant, Strike, 2003, vinyl text on electric sign, 62 x 48 x 11 inches, Edition of 3. Image courtesy of the artist and Blum & Poe, Los Angeles. In 1969, celebrated management theorist Peter Drucker wrote, with respect to the GI Bill of Rights, the passage of which he would years later characterize as perhaps the most significant event of the twentieth century, “We need acceptance of the principle that higher education for every youngster is paid for out of taxes.”1 Hardly a political progressive, this early cheerleader for privatization and pioneer of modern management science here demonstrated that rationality peculiar to the more sophisticated elements of the ruling-class during periods of social unrest. To Drucker, the GI Bill, which by covering tuition costs and living expenses opened the door to higher education for a generation of veterans, signaled the beginning of the “knowledge economy,” the defining feature of late-twentieth century America. Embracing and expanding upon this legacy, he suggested, was a prerequisite for future prosperity. To those of us distressed by the state of public higher education—where the life expectancy of colleges and universities as we’ve known them is very much unclear—words from someone like Drucker provide no solace. Indeed, they shouldn’t, since he was at bottom a reactionary whose endorsement of inclusive post-secondary education grew out of a fetishization of human capital more than from any egalitarian aspirations. On the other hand, registering this ostensibly progressive stance from someone whose profession was practicality, even if he came of age in another era and around an altogether different balance of class forces, might help us broaden our understanding of the politically possible. The point, in any case, is that if Peter Drucker thought the state ought to pay for everyone to go to college, why don’t we? After a three-decade free fall in state funding levels, US public higher education is approaching a terminal crisis. Whereas in 1980 state governments shouldered the vast majority of the burden, on average contributing close to 80% of the cost of instruction, today students bear more than half of the total expense, a trend that the simultaneous stagnation in real household income has only exacerbated. Indeed, reflecting the same market logic that has worked to naturalize the dramatic upward redistribution of income and wealth in recent decades, the increasing cost of college has been implicitly validated by a shift in how an education itself is understood. No longer conceived of as a social good, it is increasingly viewed as just another commodity whose value is best measured by the fluid laws of exchange. More significant, however, is the other side of the coin, the ways in which the increasing cost of higher education has impelled its commodification. Given the mortgage-sized investment required to finance a college education, students’ fixation on their expected rate-of-return is understandable. The stunning magnitude and rate of growth of student debt—which, now hovering around $1 trillion, has surpassed aggregate credit card liabilities3—throws into sharp relief the material forces pushing students to approach an undergraduate education as little more than a market transaction. According to the Federal Reserve Bank of New York’s Quarterly Report on Household Debt and Credit released in August 2012, after total household debt reached its high water mark in the third quarter of 2008, student debt has grown by more than $300 billion while all other obligations have plummeted by $1.6 trillion.4 As of the spring of 2011, two-thirds of college seniors graduated with student loans, and those that did owed an average of $26,500.5 Assuming an interest rate of 6.8%—the fixed rate for unsubsidized and, beginning on July 1, 2013, subsidized federal Stafford loans6—this typical student debt-holder must shell out $150 per month on interest alone to avoid watching his or her liability inch upwards. Needless to say, given that the class of 2011 was welcomed to a real world with an unemployment rate above nine percent, job opportunities that might allow graduates to begin making a dent in the principal were few and far between.7 Familiarity with the draconian nature of state budgetary politics along with a realistic assessment of the likely trend in household income in a persistently slack labor market should indicate the direction in which this student loan crisis is headed. Reinforcing this dynamic are those claims, which reek of a condescending class privilege, that college, as we’ve known it, may not be for everyone, as if there’s little to be gained—insufficient value-added, perhaps—from offering everyone the opportunity to develop their critical faculties, to encounter new and challenging ideas and individuals, and to learn for the sake of learning. Tragically, however, this reasoning has gained currency as more and more students find an education in the liberal arts a luxury good they simply can’t afford. The crisis we’re facing is thus, above all, a class issue. While most undergraduates today accumulate hordes of debt and all the anxieties that accompany it, experience material pressures to narrow their intellectual pursuits, and work one or more jobs on top of their studies to make ends meet, the prospect of such a financial burden forecloses even the hope of attending college for countless others.9 Attempts to respond the crisis, then, need to recognize that the distressing situation on campus is just one expression of a deeper affliction: the remarkable increase in economic inequality over the past third of a century. These economic and educational crises intersect at a rather cruel irony. As inequality has intensified in recent decades, so too has the argument that an education is its panacea. This is true to an extent, as the empirical record leaves no question that a post-secondary degree enhances one’s lifetime earning potential (though the Great Recession seems to have chipped away at this college “premium”).10 For more and more people, however, inequality remains the chief impediment to achieving that credential. People aren’t poor, as the reasoning so often proceeds, because they lack a college education; they lack a college education because they’re poor. Moreover, as Walter Benn Michaels has argued in this venue, the claim that a college education is economically advantageous only makes sense if access to it is limited, which—according to the “education solves inequality” thesis—must then imply perpetual inequality.11 If we’re really concerned about how inaccessible public higher education has become, then, we need to be even more concerned about the inequality that keeps it that way. Literature scholar John Marsh recently presented this case in his suggestively titled book, Class Dismissed, arguing that, “appeals to education have displaced the debate about social class and economic power that Americans need to have if we are to understand the causes of and the cure for sustained poverty and increasing inequality.”12 Providing a rich historical account of “the eclipse, by education, of other ways Americans once imagined they might get ahead,” and its corollary, “the eclipse, by economics, of other purposes Americans once imagined for education,” Marsh concludes that our best shot at combating inequality, and by extension its pernicious impact on our educational system, lies not in the class-room but in working-class organization. In concrete terms, he suggests that what we really need is a revitalized trade union movement. To be sure, at first glance Marsh’s proposal seems out of place, not least because trade union membership is now at a century long nadir. According to the most recent figures from the Bureau of Labor Statistics, less than twelve percent of the national workforce—and fewer than seven percent of private sector workers—now belong to unions.13 These figures alone tell a grim tale, and they go a long way toward explaining the astounding concentration of income and wealth—and the deepening plight of the American working-class—that has occurred over the past thirty years. A recent study demonstrated that, between 1973 and 2007, private sector unionization plummeted by 75% while economic inequality rose by 40%.14 Bleak statistics notwithstanding, as Chris Maisano has perceptively argued, the impulse to fetishize union density tends to obscure the simple fact that, continuing to represent more than fourteen million workers, “American labor unions still have a mass membership base that few other institutions can match.”15 The very zeal with which the Republican Party continues to attack organized labor’s right to exist testifies to their corporate backers’ opinion that, far from being irrelevant, trade unions still pose a real—redistributive—threat. Marsh’s argument represents a refreshing departure from the fundamentally bootstrap discourse on inequality so common in liberal circles, and those of us who believe an education ought to be a basic social right, a liberating experience that everyone is entitled to—rather than a means for enhancing “human capital” or employability—can profit from considering its strategic implications. First, it calls for orienting our higher education politics along a working-class axis, recognizing that the increasing cost, decreasing accessibility, and deteriorating labor conditions on campus are class issues. Second, it involves highlighting the common denominator in the increase in economic inequality and educational inaccessibility: the neoliberal assault on the public sector. It’s no coincidence, of course, that the public sector also happens to be the last bastion of trade union power. The struggle for the future of higher education, then, as with the fight for organized labor’s survival, needs to lead us toward a broad-based movement that stresses the important role the public sector can play in alleviating the inequalities that capitalism invariably produces. Doing so requires parting with the defensive posture—resisting a tuition hike here, a departmental closure there—that has characterized campus politics in recent years, rear-guard struggles that in practice always reduce to negotiating the best possible terms of a defeat we’ve implicitly conceded. We urgently need, instead, to take the offensive by advancing ambitious campaigns around the specific concerns ordinary people hold. A perfect way to start is by proposing and organizing around what even Peter Drucker recognized as the only real solution to the crisis in our colleges and universities: free public higher education for all, funded by the federal government. This argument rests on the belief that access to higher education should be a basic social right, an ideal that can only be realized through its complete de-commodification but one that also, as the history of the Jim Crow south should always remind us, demands a strong federal role. Even more immediate material and political realities, however, point to why higher education politics must be conducted at the federal level.17 The ubiquitous state and municipal fiscal crises propelling the assault on public higher education show no signs of easing, and the assumption, whether or not it’s articulated as such, that we need to wage fifty isolated campaigns to limit our losses is politically as defeatist as it is misguided. Most individual states are indeed broke, and while their insolvencies could be rectified through, say, more progressive taxation, achieving those structural changes fifty times over is impossible. Only the federal government has the capacity to do the necessary pump priming and if for only that reason it must be our target. The inability of such revered public institutions as the University of California and the City University of New York to maintain their historic commitments to tuition-free college education in the face of fiscal shortfalls and right-wing offensives, two sides of the same coin, underscores the need for a federal solution to the deepening crisis in post-secondary education. As management guru Peter Drucker famously celebrated, the federal government has a history of experimenting with free higher education: the Servicemen’s Readjustment Act of 1944, widely known as the GI Bill of Rights. One of the most popular pieces of legislation in modern US history, the GI Bill provided access to higher education for eight million veterans returning from World War II by paying all tuition costs and providing a stipend to cover living expenses. More than 40% of recipients indicated that they would not have attended college were it not for this program, and a report issued by the Congressional Joint Economic Committee nearly half a century after its passage demonstrated that for every $1 spent implementing the GI Bill the federal government reaped almost $7 in tax revenue through the income and productivity gains it helped to generate.18 The program also had a far-reaching economic ripple effect: the robust postwar growth in student enrollment triggered a campus construction boom, allowed for the hiring of thousands faculty and staff members, and stimulated commercial development around campuses across the country. Beyond its democratizing and emancipatory social impact, free higher education would be a job creator! The real question, of course, is how to build a movement around a major social program in an age of austerity. We can start by recognizing that, as long as we live under capitalism, all politics are class politics and that, moreover, for more than three decades the scale has tilted further and further away from working people. The liberal instinct to legislate, then, clearly isn’t an option. Reasonable ideas and smart policy memos don’t initiate progressive change, only social movements do. In a strange way, actually, recognizing our utter powerlessness in the short-term can be liberating, for since there’s no reason to concern ourselves with technocratic matters we stand no chance at influencing we might as well think creatively and strategically about how to fashion a new politics on our own terms. Seriously challenging the crisis in public higher education will require a looking beyond the electoral realm and adopting a longer-term, organizing approach to politics, one animated by working peoples’ concerns. For two reasons, this brings us back to the labor movement. First, weakened though they may be, and with all the limitations of their often sedentary bureaucracies, trade unions—with their fourteen million members—remain the only organizations with the capacity to sustain such an ambitious movement. Second, though critics, from the left as much as the right, are generally too eager to blast trade unions for their allegedly myopic concern for members’ interests—they are, after all, membership organizations—it is obvious that the labor movement is in desperate need of revitalization. An organized labor campaign for free college could help to start that process, committing it to an ambitious working-class vision unlike anything its been connected to in the concessionary climate engendered by neoliberalism and appealing to a generational cohort entirely unaware of the labor movement’s progressive potential. In the first week of September, after six grinding months on strike, four of which followed the government’s passage of the punitive Bill 78 that sought to legally forbid the students from engaging in any disruptive activity, Classe emerged victorious when the provincial government retracted the tuition proposal. While it is unclear how the students intend to build upon this tremendous success, it is safe to say that their ambitious approach, not merely defending what they had but pursuing much more, was an educational experience in collective action, and one that has shifted the center-of-gravity in higher education politics in that province for the foreseeable future. Far from spelling the end of neoliberalism, the economic crisis now marching into its fifth year has intensified it, proof that this increasingly dystopian order will not collapse under the weight of its own contradictions. Its fate depends, above all, on the balance of class forces in this country, and tilting that in our favor requires diligent organization and capacity building. In that spirit, the CTU and Classe have provided a model to aspire toward as we begin to think practically about how to advance the struggle. Perhaps most importantly, they have demonstrated that effective organizing must begin with a clear and ambitious objective, one that can appeal to all those working people we need but who may not necessarily agree with us from the outset. In the process of engaging ordinary people around a tangible goal—free public higher education, for instance—a more expansive political vision is sure to emerge. Higher education as we know it hasn’t existed forever, and if current trends continue it won’t survive much longer. The once revered American public college and university system was born in the turbulent milieu of class struggle in the immediate post-World War II period, and was spurred materially by immense federal spending on such programs as the GI Bill. By the 1980s, after only a few short decades on its feet, it was under attack, and reflecting on how grim conditions have become in just a generation makes it chilling to think of where we’ll be in another absent a radical change of course. Needless to say, the urgent need for a serious movement, one anchored to a coherent demand but that also serves to valorize the public sector—to demonstrate that it shouldn’t be a site for ever more perverse forms of capital accumulation but, instead, one that mitigates the effects of that destructive process—couldn’t be clearer.27 A national campaign for free public higher education is a perfect way to start, and it’s one we can win. Samir Sonti is a graduate student in history at the University of California, Santa Barbara and is a member of UAW Local 2865.